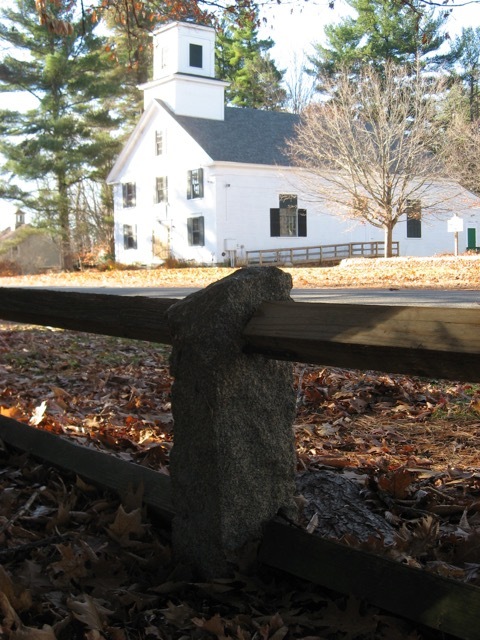 Andy’s sits on the site of the original meeting house of Wilton, a log structure built in 1752 but then torn down and replaced with a larger meeting house in 1779. The second meeting house served the town for 80 years until it unfortunately burned down in 1859. The town voted to build a third meeting house (the building that stands today) on the same spot, at a cost “not to exceed $2,500″ and the building was completed in 1860. The original Paul Revere and Sons bell damaged in the fire was recast by Henry N. Hooper & Sons of Boston and placed in the new building, where it remains today in the bell tower. In 1883, the town moved its business to a new Town Hall located several miles to the east in what is now downtown Wilton, so the current building was sold in 1884 to a group of interested citizens and renamed Citizens Hall. It served for many years as a public meeting hall, and was taken over by the Advanced Grange organization in 1925, which used it for their meetings, and then by Wilton Lions Club in 1968. The Pine Hill Waldorf School bought the building in 1978 and for several years ran a school on the site. It was sold to Andy’s Summer Playhouse on August 11, 1985. Andy’s Summer Playhouse grew out of the dream of two teachers in the Mascenic Regional School, Margaret Sawyer and William Williams, during the summer of 1971. They hoped the playhouse would keep alive a theater experience that had occurred at their high school that spring. The Playhouse found its first home in Mason, New Hampshire. Here the enthusiasm of its founders drew the support of several area residents who offered not only financial assistance, but the generous gift of their talent. Most notable among these is Elizabeth Orton Jones, illustrator, author and playwright, whose contribution through the years has been of vital importance to the artistic growth of the playhouse. “Andy” was a beloved summer resident of Mason, internationally known as C.W. Anderson., a jovial, outreaching man who loved young people. He wrote and illustrated stories about horses and children, many of which have a Mason background with pictures of local boys and girls. In the world of art, he was known for his meticulously beautiful renderings of animals and people, and in the world of youth, for his untiring interest and faith in new generations. “I know well that only the rarest kind of best in anything can be good enough for the young,” said the poet Walter del a Mare. Andy believed that implicitly, and lived it too. Thus it was only fitting that the new venture should strive to honor his memory.